The Sno Cat was the main workhorse of the base. We were located about 15km inland, so the sno cats were responsible for getting all of the supplies (including personnel) from the coast up to base. They have four big rubber tracks with metal teeth to grip on the snow & ice. They are 4 track drive & 4 track steer, to aid manoeuvrability and there was a great big engine under the bonnet. If you would like find out more about sno cats, check out the Tucker website. We had quite a few cats on base, but only the oldest, most rickety cats were operated on the sea ice. It is not unknown for them to go for the odd swim. Consequently each sno cat has a standard British Antarctic Survey modification - an escape hatch in the roof. When driving on sea ice, this hatch is left open to ease escape. When a lot of people needed a lift, we would often end up sitting on the sledge behind the sno cat. With 4 big tracks churning up the snow, the passengers usually ended up snowed in. In the cold winter, the sno cats are left hooked up to electrical heaters to keep the oil in the transmission, gearbox & engine slightly less solid. Even with this precaution, it would take a couple of hours to warm a sno cat up to operating temperature. When I say operating temperature I don't, of course, mean a human operating temperature. Even in the cab it was really cold so thick clothing was a must either inside or outside the sno cat when it was -30C outside. 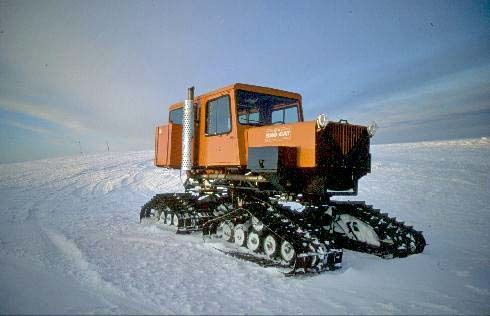 This handsome fellow was the sno cat that I used 12 hours a day for two weeks when I arrived at Halley, during the hectic unloading of ships cargo. The trip from base to ship was about an hour each way. 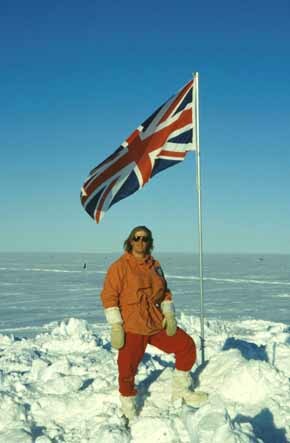 You would set off with an empty sledge, trundling across the ever worsening snow surface ( as you can imagine, the route between base & ship got churned up into a very nasty lumpy mess after a couple of days) trying to stay awake with very little to keep the interest up (Halley was flat so all I could see was a line of 45 gallon drums disappearing into the distance). Upon arrival, I would unhitch the empty sledge & hook up to a full one in the blinking of an eye & then set off for the return leg. Trundling along with nothing to look at but snow and oil drums. Occasionally, I would pass another cat & give a wave. Tedious, but necessary work. In the summer when there was no sea ice at the coast, the ship couldn't unload so the unfortunate drivers had a 4 hour each way trip to the low ice shelf further up the coast at N9. Sno cats are surprisingly agile. An excellent design for these conditions. This one was being driven by the mechanic, who was showing off what his baby could do. This was my second winter & I wouldn't have though of going up such a steep slope until I saw him do it. Antarctica is full of surprises. The amount of snow stuck to the cat indicates that this was a cold winters day. The picture above shows no snow stuck to the cat, so it was taken in the summer. This is one of the older sno cats that only came out in the summer to work on the sea ice. It only has two seats, so is only suited to hauling sledges. Here are the summer cats in a line. The one on the right is a sno groomer. The cab is on backwards & it has a little bulldozer blade on the front. This was used to maintain the ramp down from the ice shelf to the sea ice. The ramp suffered quite badly due to the amount of traffic when unloading the ship. Next along is another specialist. The green arm above the cat is a cherry picker (hydraulic platform), used in the summer when maintaining the buildings. All these vehicles started out the winter on a mound about 2 metres high. After a few months of storms, the snow accumulated around the mounds, than over the vehicles. This is not a problem for the vehicles.